Curated by Carol Ann Klonarides, Che Mondo (What A World) at the LA Municipal Art Gallery asks, “If, in the age of omnipresent digital photography, everyone can be, and in fact is, a photographer, how does one remain a ‘Photographer’”? This exhibition points to answers by presenting artists whose photographs rely on specific material execution to claim a physical presence and inscribe conceptual meaning. The result is a truly inquisitive and captivating exhibition. One alluring body of work comes from Julie Schafer whose large pinhole camera photos document landscapes marking the borders of 19th century mining zones. These works reflect one of the most basic ways of making a photograph; light passing through a tiny aperture imprints on chemically treated paper. Printed in the negative (with light areas appearing dark and vice versa), the impressively tall photographs succeed in alienating viewers from familiar bucolic scenes like piney hilltops and desert landscapes. The work is mysterious, but perhaps too much so. Schafer’s project, which interrogates the legacies of mineral extraction and removal of indigenous peoples, could use more wall text to relay the artist’s intention. Without this the work risks coming off solely as a sign of photographic virtuosity, an updated Ansel Adams shtick. Christopher Russell’s work convincingly merges photography and drawing to create one-of-a-kind objects. He uses an Xacto blade to scratch into the surface of a set of identical photographs, each bearing an “oops” image of a thumb on the lens. One image contains a sinking ship, another a stream of disjunctive text, and in another, frenetic lines resemble veins or brain synapses. This mark-making violates the clean surface photographers traditionally hold sacrosanct. Through this process Russell calls attention to the way we interpret photos from subjective points of view while commenting on the frailty and latent violence that comes with fixed meaning. Russell’s installation also includes a massive but conspicuously non-photographic hand-drawn artist book containing his most recent novel. However, I wish it were easier for visitors to page through the fascinating and enormous tome, which is kept safe by a Do Not Touch sign. The most powerful work in the exhibition is Susan Silton’s Color Theory, which consists of a chair facing a projector screen, which presents a never-ending loop of images emanating from an old school projector. Sitting in a single chair, one watches a slow pan of stamps taken from the artist’s grandfather’s collection from the Third Reich, each bearing the image of Adolph Hitler. This philatelist archive invites questions about collecting the past as a way to view the present. Here Hitler’s image speaks to photography’s use in propaganda, while the stamps sign to the record of a country’s official history as well as a the currency of communication. Finally the slide projector, itself all but obsolete, engenders a didactic experience. Yet what we “learn” from this set up remains elusive. The work’s cool detachment allows for self-reflection and perhaps a bit of indictment, a moment of serious rumination on the passage of time from one fascist institution to the next. Alexis Smith is an O.G. collage artist whose parings of text and image have unraveled complex narratives in viewers’ minds for nearly half a century. Her first show at Honor Fraser, Slice of Life, is a kind of retrospective of sorts, including work from as far back as the 1980s. The exhibition is a testament to Smith’s ongoing role as a keen observer of American culture, a continuing inspiration to generations of artists to come. Slice of Life’s highlight is undoubtedly Past Lives, a work originating in 1989 as a collaboration with the writer Amy Gerstler. The installation takes up an entire room, filling it with a diverse collection of weathered children’s chairs, from a classic wooden rocker to a Lilliputian canvas director’s chair. As one circumnavigates the empty seats, a palpable sense of absence takes hold. Nearby, a schoolroom chalkboard bears sentences befitting an obituary headline, like, “Came to literature late.” The entire installation conjures thoughts of how indoctrination marks one from early childhood, how ideology, circumstance, and the language of control determines the roles we play in life. Alexis Smith, Black and Blue for Howie Long, 1997. Mixed media collage, 29 x 19 x 4 in. Many of Smith’s works use humor as a foil to discuss issues of violence, manipulation, and American culture. This is no better seen than in a 1997 mixed media collage, “Black and Blue for Howie Long.” In this work we read the NFL player and bit actor Howie Long’s pithy quote, “ I am an artist. My art is assaulting people” written in comic sans on a large painter’s palette alongside a photograph of two men wrestling, with one head replaced by a Georgia Bulldog’s face. Continuing the sports tableau, a baseball bat and children’s toy tomahawk sit atop the palette like menacing paintbrushes. The work’s tautological wordplay ricochets around the gallery, branding the “artist” as a contextual and perhaps menacing position. Such a proposition deserves a chuckle. Yet the play of meaning doesn’t stop there. 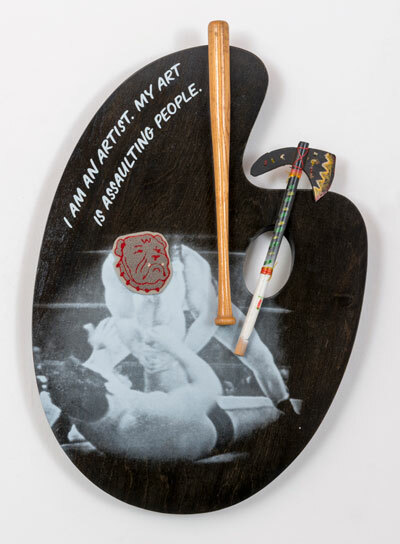 The baseball bat and tomahawk continue the chain of signification, pointing to both America’s pastime: baseball, and America’s past time: Native American history and identity and a culture relegated to sports mascots and comic caricatures. At least that’s how I see it. 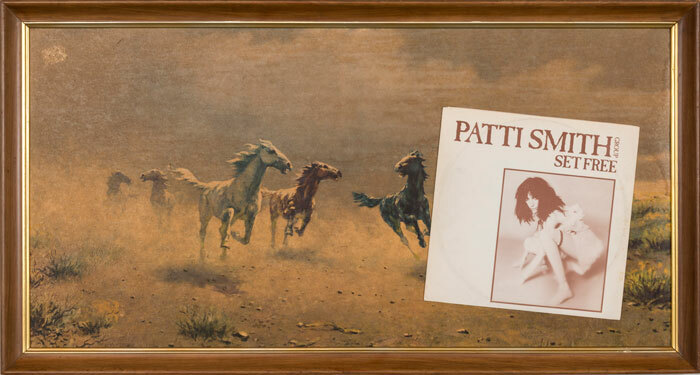 There are equally engaging recent works in the show, like “Wild Horses,” a 2012 collage of the cover of the Patti Smith Group EP “Set Free” placed above a thrift store painting of unbridled horses in a desert landscape. Such a simple construction performs impressive and lasting tricks, riffing on questions of high and low, artistic titling, and the importance of name recognition. Its word and image play is so perverse I wish it were a billboard on Sunset Blvd. Alexis Smith, Wild Horses, 2012. Mixed media collage, 22 x 24 in. Like Rauschenberg before her, Alexis Smith’s work, at its best, plays expertly on the precipice of communication. In her most successful works signifiers flirt with intelligibility while refusing didacticism. Smith’s constructs her signifiers with considered arrangement, with just enough connections to create an ouroboros of signs, with one image’s meaning devouring another, with no final cathartic “resolution.” The images turn back on themselves allowing for a slow-burn critique that always finds itself home in the present. Tucker Neel is an artist, writer, and curator in Los Angeles. He is also the director of 323 Projects, a voicemail gallery that can be reached anytime by calling (323) 843-4652. This press release was a work of art I contributed to Artillery Magazine’s “Celebrity” issue in July of 2013. The press release was published, as is, with no explanation, in the magazine. The National Museum of American History is pleased to presentPresidential Pictures: Paintings & Drawings by Dwight D. Eisenhower, Ronald Reagan, and George W. Bush. This unprecedented exhibition brings together works from three of the most powerful and influential men in American history. Presidential Pictures will no doubt open the public’s eyes to the fact that these men were not just great politicians but also true artists. While he is best known as the American president who desegregated the U.S. armed forces and public schools, signed the Civil Rights Act of 1957 and 1960, and articulated the anti-Communist “domino theory,” Dwight D. Eisenhower was also a dedicated painter. Having taken up the art in 1948 to relieve the stress of being Chief of Staff of the U.S. Army, Eisenhower created hundreds of images before, during and after his presidential tenure. He even had an artist’s studio installed in the White House. Always a straight-shooter, the former President was quick to dismiss symbolic meanings viewers might read into his tranquil images of farm houses, mountains, and mirthful family members. At a 1967 exhibition of his paintings, the former president told United Press International reporter Richard Cohen, “They would have burned this [expletive] a long time ago if I weren’t the president of the United States.” Referring to his portrait of Abraham Lincoln—based on a photo by Alexander Gardner—one cannot help but consider the thoughts that went through the artist’s mind as he carefully rendered the shine on the forehead of his heroic predecessor. President Eisenhower’s work is provided courtesy of the Dwight D. Eisenhower Museum, The Lyndon Baines Johnson Library & Museum, and David and Julie Nixon Eisenhower. It’s no secret that Ronald Reagan was an actor before he was a politician, starring in dozens of films, from Santa Fe Trail to The Voice of The Turtle. Political and film historians have proposed that President Reagan’s work as a stage and screen actor, President of The Screen Actors Guild, and spokesman for General Electric, allowed him to cultivate a “Teflon” façade, an impermeable presence that deflected criticism from the Iran-Contra affair to his indolence at the dawn of the AIDS crisis. But did you know President Reagan was also a cartoonist before and after his time in office? Visitors to this exhibition will get the rare chance to explore President Reagan’s prolific drawing practice through his images of cowboys, horses, football stars, butlers and even caricatures of hook-nosed men and mustachioed Asian faces. As President Reagan said in a 1984 letter to political cartoonist Jeff MacNelly, “I am a cartoon aficionado up to and including reading the comics every morning.” Amidst these pictures—most of them doodled on White House stationery—one sees the president’s externalized mental space in the moments between moments, when meetings got a little too boring and he needed some distraction. President Reagan’s work comes to us courtesy of The Ronald Reagan Presidential Foundation and Library and the many private collectors credited in the exhibition’s catalog. Unlike his artistic predecessors, George W. Bush took up the palette knife after leaving office. America knows the Decider in Chief as the man who battled for the contentious 2000 election, initiated the invasions of Iraq and Afghanistan, and signed The Patriot Act into law. But in 2014, President Bush had his first museum show of portraits comprising images of global leaders such as Vladimir Putin and the Dalai Lama, all taken from the Google image search engine. Since then, he’s never looked back. Speaking of his now prolific painting practice, President Bush told CNN’s John King, “I relax. I see colors differently. I am, I guess, tapping a part of the brain that, you know, certainly never used when I was a teenager.” Amongst the former president’s numerous portraits, visitors will have the opportunity to fully experience the former Commander in Chief’s visual perspective on what it was like to connect with global leadership. President Bush’s paintings appear courtesy of The George W. Bush Presidential Library and Museum. A catalog with essays by Lynne Cheney, Jerry Saltz and Roberta Smith accompanies this exhibition. Feb. 6: To celebrate his birthday, the museum will screen Knute Rockne: All American, starring the former president. A panel moderated by former California governor Arnold Schwarzenegger will follow. Starting Feb. 14, President George W. Bush will teach a 10-week drawing and painting class, focusing on classical technique. Students will produce a portrait and a still life, using live models and nature mortes arranged specifically by the 43rd president. Reservations required. Missing! A photographic survey of looted artifacts from the Vietnam, Afghan and Iraq wars. At first glance Charles Fréger’s “Wilder Mann”—an exhibition filled with photographs of furry giants and frolicking monsters—may seem inconsequential. Yes, the work is fluffy and intentionally entertaining on the surface, but it goes much deeper. After one fully understands Fréger’s overarching project, it becomes apparent that there might be a productive critique lurking behind the photographer’s spectacle. 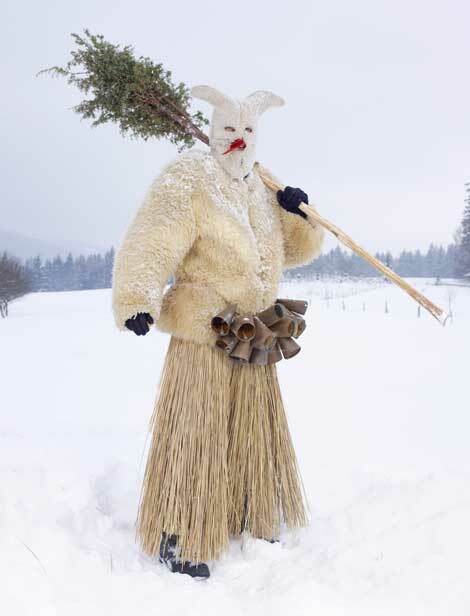 In 2010 the French photographer began traveling to rural farming villages in over a dozen European countries to document people, pictured mostly alone, out in the wilderness, wearing homemade costumes used in celebratory events marking the solstices, the harvest and coming of winter—calendar dates that, after millennia and the “civilizing” of Pagan populations, eventually mutated into Christmas and Easter. 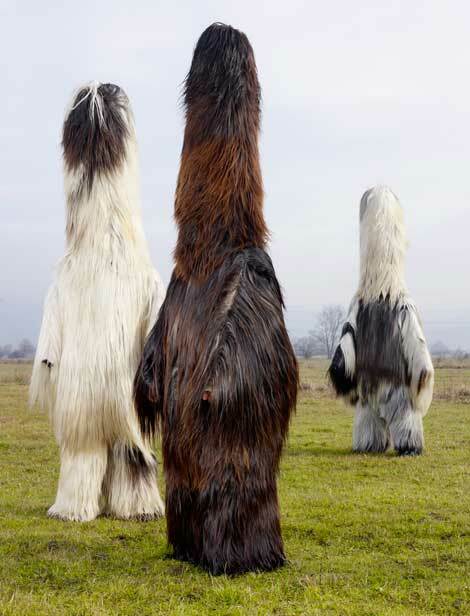 The costumes referencing human/animal hybrids are cobbled-together, yet visually astounding. 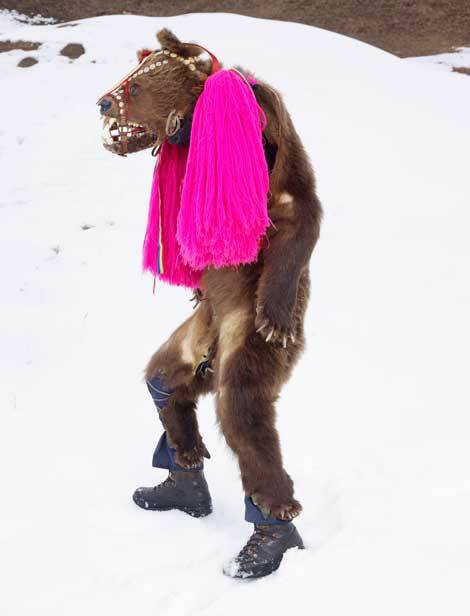 In one characteristic photo, Peluche; Evolène, Switzerland (2013), a figure in a snowy landscape wears waterproof pants and mounds of animal pelts piled high like a football player’s shoulder pads. His tiny badger face and gigantic lumbering body creates a funny juxtaposition. Dozens of other creatures in more framed photos create a similarly strange cast of characters. 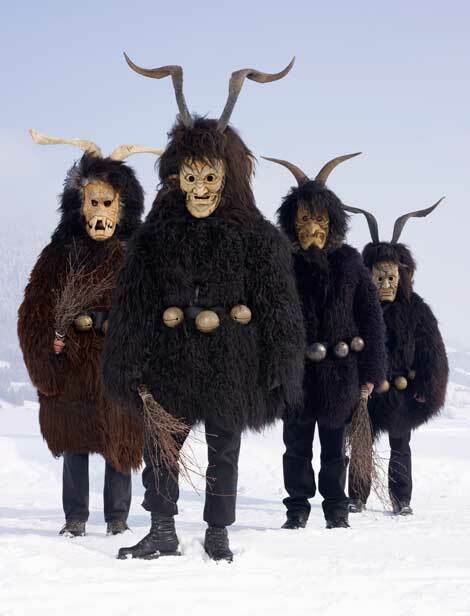 There are awkward straw men, farmers with ballooning marshmallow bodies, demons on parade, and totemic figures covered in hair. Fréger photographs each subject like a fascinated anthropologist, collecting documents of the strange and unusual from distant lands. But these subjects are closer than they seem, some living just beyond the city. It is Fréger’s ability to render the “rural European” into a cultural oddity that creates a startling, perhaps unintentional, critique, dependent on the exhibition’s position within the museum’s larger curatorial framework. Fréger’s photos in proximity to their 20th century “exotic” counterparts create an extenuation of Foster’s analysis, a complication of European identity in relation to an imagined exotic other. If we see Fréger’s work as collapsing the physical space between the civilized and uncivilized, then does this also disrupt the temporal space of “now” and “then”? 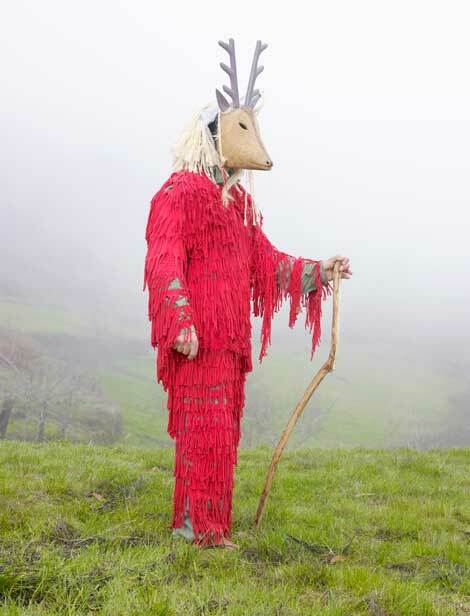 In Fréger’s photos the European is made “primitive” through costuming like his colonized counterpart. While this contrast is perhaps superficial, in no way speaking to the destructive legacies of exploitation and racism that colonization left in its wake, perhaps a show like Fréger’s can, if only momentarily, deconstruct the European mythology of cultural supremacy, which is itself a truly terrifying monster. Interview With Lorenzo Hurtado Segovia,” Artillery Magazine, Mar/April. 2013. Lorenzo Hurtado Segovia loves to create objects expressing hybridized meanings, calling attention to how things are not as simple as they first appear. For “by Deborah Calderwood,” his first solo exhibition at CB1 gallery in downtown Los Angeles, he presented paintings appropriated from his wife Deborah’s early childhood drawings, touching on notions of originality and love. For “Papel tejido,” his second solo show, he wove blanket-like forms emblazoned with crosses and steeples from painted paper strips, mingling textile traditions while frustrating the anti-image modernist grid. Hurtado Segovia is currently using those lacing techniques to create embellished pillars and poles that connotatively explore archetypical symbols of faith and power. His formal propositions launch complex discussions about the meanings we invest in everyday objects and the shared histories that make up who we are. I recently sat down with Lorenzo in his home/studio in Tarzana to discuss his past projects and his recent work. Artillery: In keeping with the theme of this issue, what are your thoughts about Mexican and American identity in relation to your work? LHS: My upbringing was first solidly in Juarez, then a border experience, then LA. Now I’m a naturalized U.S. citizen through an amnesty process initiated by family members who dug out my grandma’s birth certificate from California. I’ve been in LA for 11 years. I have a lot of thoughts and emotions shaped by my Mexican psyche. But my day-to-day reality is informed by the United States, by U.S. politics and Chicano politics more specifically, especially with California’s anti-immigrant history, prop 187 and our proximity to Arizona. [In] my work, a lot of things I see now have threads going back to my youth, especially the notion of being handy and making things. In Juarez everyone needed to know how to do things, put up a wall, mend sheets, fix things. I see this history informing what I do now. I’m wondering how you see your formative years impacting your practice? Well, when I was 8, my grandmother would take me to this craft store once a week. I would make my mom purses with macramé, and other gifts too. Also in downtown Juarez there were men making bracelets and pens with woven names on them… and crucifixes. I learned how to make those and I started selling them in school. 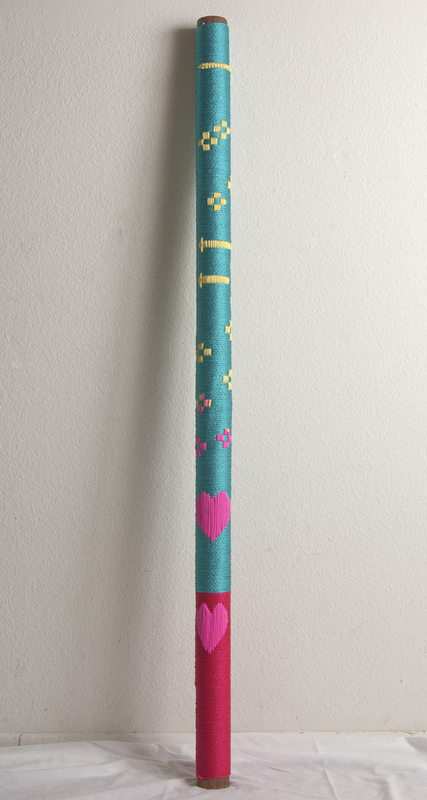 This is where the new work comes from, the weavings on the dowels. How did you come to incorporate this approach into your practice? Near the end of grad school I started thinking that Modernism missed an opportunity. Through its self-referentiality it explored a lot of ideas but nixed using the broader cultural associations that come with certain materials. I thought, “There’s a conceptual opportunity here.” This led me to the paper weavings, which were interested in the modernist grid and the painterly gesture. By cutting up the gesture and putting it into the grid I was able to make associations with fine art, but also non-fine art—like basket weavings, textiles, and craft traditions. 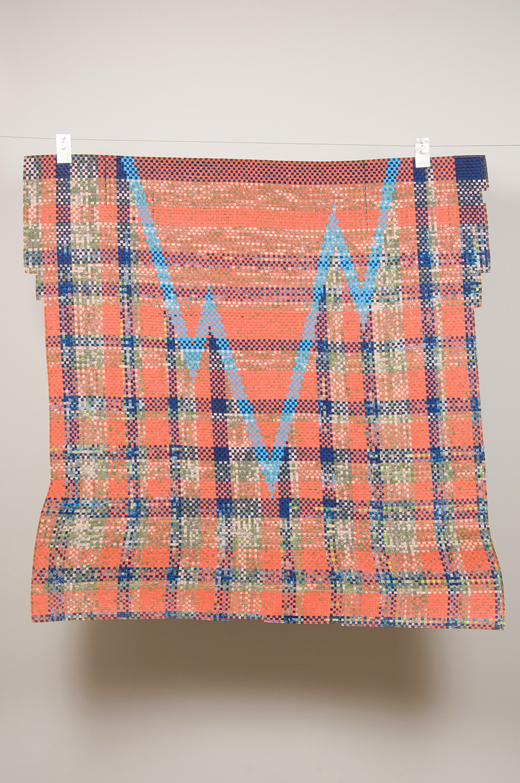 The weavings also occupy a liminal space; they are weavings, but also paintings, and they are also sculptural, so within the taxonomies of the art world that is a critical position to take. You use a lot of Christian content in your work, the crosses and religious heraldry. Do you see your work as Christian? I want my work to be particularly Christian and not be lost in some new age spirituality. In the U.S. fine art context Christianity is often associated with right-wing politicians and social conservatism. With these Christians the only thing we agree on is that Jesus Christ is the Son of God and our Lord and Savior, but beyond that, with regard to politics and society, we have very little in common. In the last two years I decided to make Christian content more prevalent in my work, but I hope my work is rich in content and not just about one message. I’m not interested in making Caravaggio paintings that tell a story. I’m more interested in the materials that the Saints surrounded themselves with. That’s been difficult to do because it’s a negotiation with materiality, content and Christian associations. How that’s resolved, I don’t really know, which keeps me interested. “Graphic Design: Now In Production,” Artillery Magazine, Jan/Feb. 2013. Sourced from mostly North America and Europe designers, “Graphic Design: Now In Production” provides a valuable, although somewhat cursory opportunity to survey the dispersed practices populating the design world today. As the first traveling museum show in America focusing solely on contemporary design in the 21st century, this exhibition is important primarily because it’s the only one of its kind (at least in America) proposing a survey of the field. While there are precedents, like “Graphic Design In America” from 1988 and “Mixing Messages” from 1996, there are no other recent exhibitions against which we can judge “Now In Production’s” curatorial framework or critical reception. This results in the exhibition feeling a bit rushed, as if it were making up for lost time. However, in presenting us with so much, the curators, Ellen Lupton and Andrew Blauvelt allow visitors to reflect on a diversity of design practices, presenting design as a challenging provocateur and an embedded fixture of everyday life. The exhibition is most engaging when its work blurs graphic design and fine art, client-based needs and individual projects. For example, Michiel Schuurman pushes the capabilities of the Adobe Creative Suite to extremes, producing Op-Art indebted, typographically charged, posters pulsating with dizzying moiré patterns. Sure, they communicate like posters, with times and dates for events, but they do so in a way that flirts with psychedelic incomprehension, questioning just how we read information. 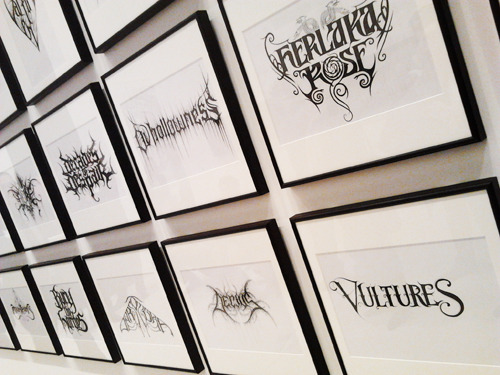 One of my personal favorite bodies of work is Christophe Szpajdel’s hand-lettered logos for dozens of death-metal bands from all over the world. Szpajdel takes email orders for these designs, prints out the request, and draws his mirrored, tendril-y creations on the back of the paper. The collection testifies to how one man can define the aesthetic predilections of an entire musical genre, and highlights the important merger of digital communication and good ole fashioned hand skills. Unfortunately “Now in Production” doesn’t allow for visitors to page through most of the exhibition’s impressive collection of books and magazines, which exist sealed in transparent display cases. I would understand if these were truly rare publications, but many, like illustrator Mira Kalman’s engaging The Principles of Uncertainty, are available at most bookstores (including the museum’s) for less than $20. Letting the reception of these publications continue to exist only in places of commerce is a truly lost opportunity. Additionally, problematic displays weaken the show. This is the case with an installation featuring the popular Brand New website, which blogs about the re-branding of companies big and small. With this installation, visitors use yellow tokens to vote on logo changes for companies from Starbucks to the New York Public Library. Sadly, the experience resonates as uncritical of the mechanisms shaping brand allegiance and simply mimics a shopping experience. It’s also worth noting that in light of the recent Hammer Biennial Mohn prize, this installation appears as another example of false populism, the facade of participation masking real decisions dictated from the top-down. Overall, this exhibition’s chimeric ambitions propose a fortunate solution: major museums, as caretakers of an ever mutating cannon, must fill the holes in their peripheral vision and mount more exhibitions dedicated to charting the field of contemporary design. The graphic design and fine art worlds need to further embrace cross-pollination with the understanding that such hybridization can only help us all evolve together.